Classical Physics (Physics established mostly by Newton), has one property that we may think that is universal, which is, certainty. For example, by using the mathematics of Newton, we can precisely predict the position of a particle in space as it falls or as it is thrown as a projectile. But in the quantum world(the world of the very small, of electrons and other particles), things are very different. In fact, it is very different that we may find this quantum world, weird. To show this, we will follow an experiment done in 1801 by Thomas Young called the Double Slit Experiment, and study its conclusions. If we were to throw a bunch of classical particles (rocks, for example) randomly into two slits, we would expect to see the pattern that is pictured above, right? Some would travel through the slits, others would bounce off the barrier, and we would see the streams of particles that managed to travel through. Nothing weird about that. But let’s enter the quantum world. When we use electrons instead, and make the slits very narrow, something really weird happens. Instead of seeing the same pattern that we saw with classical particles, we now see several bands where these electrons hit the optical screen. Weird right? That’s not even all of it. Many years before this experiment was actually preformed, we established that electrons are particles. In fact, it is still what is taught today in schools. The problem is, that pattern that we see for electrons is what is called a “diffraction pattern.” This diffraction pattern is what physicist would expect to see if, instead of particles, waves were going through the two slits. In the later part of this video by Veritasium, water waves are used to show how this diffraction pattern is created. So, what really happened there? Is our well established understanding, that electrons are particles, wrong? Or is there some other unknown that caused the diffraction pattern? First of all, the premise that electrons are particles is wrong. Does that mean that the electron is a wave, and everything that we learned about it in school is wrong? Not quite. The electron, in fact, is both a particle and a wave. In quantum mechanics, this is called wave-particle duality. It may seem impossible for something to be both a particle and a wave. We all know what a particle is, and we know that it is very different from a wave. A wave, by definition, is a disturbance that travels through a medium from one place to another. This is very different than a discrete quantity of matter, which is what a particle is. However, it is possible for an electron, and all quantum particles, to be both particles and waves because they exist as a strange kind of wave—a probability wave. This probability wave is mathematically described by Schrodinger’s wave equation. Unlike all of the equations previously uncovered, it does not calculate the specific outcome of an event, but the probability of all outcomes. For an electron, this wave equation calculates the probability that we will find an electron in a specific point in space. Like the water waves shown in the video, this wave function also adds up and cancels out to give the diffraction pattern that we saw. So, we don’t really know where in the two slits the electron will pass through; we only know the probability. What if we put some kind of detection device in the two slits to measure where it actually passes? Well, scientists did that. ,During this observation, the pattern that they saw on the optical screen changed to what we would have seen if we used classical particles (the one on the first picture). This leads us to another weird phenomena in the quantum world, which is called “superposition.” One famous example of superposition is the thought experiment called Schrodinger’s Cat. 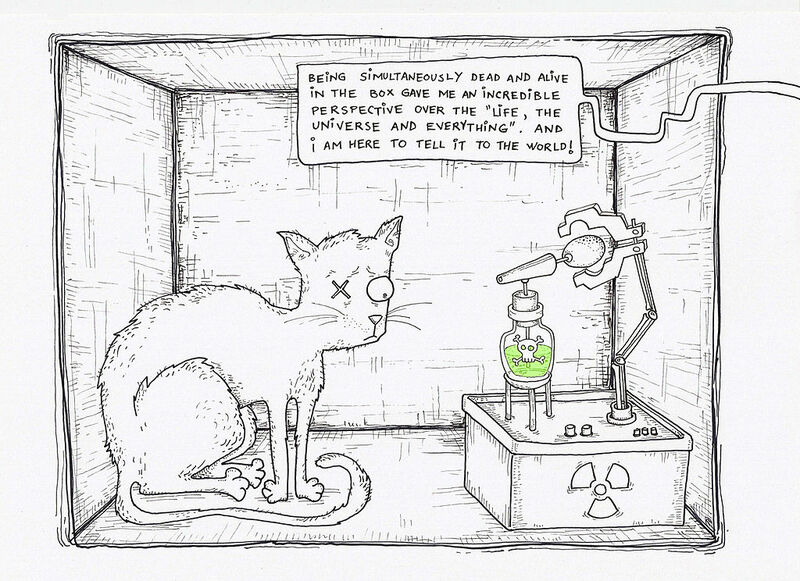 This thought experiment starts with putting a cat inside a box with a bomb that may or may not detonate, with equal probability that it will and will not go off. Once we close the box, we don’t know whether the cat is alive or not, only the probability. The quantum interpretation of this is that the cat is in superposition: it is both alive and dead. Opening the box to determine whether the cat is dead or alive forces nature to choose between the two states. This is what happens with the double slit experiment if we put detectors in the two slits. When electrons pass through the slits as a wave of probability, the detectors forces nature to choose between states, collapsing the wave function to a single state, and it effectively makes the electron behave like a classical particle, resulting in the change in pattern. For some physicists, this concept is very hard to accept because it means that reality itself is altered by the one making the observation. Albert Einstein didn’t even accept this idea at first, as shown in his statement: “I would like to think that the moon is there, even when I’m not looking at it”. In the end, the double slit experiment discovered that electrons, and all quantum particles, both exist as particles and probability waves. Quantum particles existing as probability waves means that we don’t know for certain where these particles are, we can only know the probability of where they will be. These particles are said to be in superposition. This means that they are in all possible states at once. Once we try to observe the state of this particle, the wave function collapses into a single state. What we learned from this experiment is that the quantum world is very weird in the sense that it is very different from the world that we generally perceive and live in. You can actually see the diffraction pattern in the double slit experiment right now. Instead of using electrons, we will use light, and instead of a double slit, we will use a single slit. Just look at a light source through a small gap between two of your fingers. You will see black lines parallel to your fingers. These black lines are the spaces in the diffraction pattern where light destructively interferes. The photons of light, also has a wave-particle duality, that is why it is also possible to do this experiment with light, rather than electrons. Lockheed Breakthrough In Nuclear Fusion Energy: Will It Work?